The tourism sector is estimated to have contributed over Dh150 billion ($40.8 billion) to the Dubai's GDP (4.6 per cent of GDP) in 2017, providing almost 570,000 jobs (4.8 per cent of total employment), said a report. The sector’s direct contribution to GDP has increased by 138 per cent in the 10 years to 2017 with employment in the sector growing by 119 per cent over the same period, according to industry expert Knight Frank. This trend has been driven by the increasing level of connectivity on offer from Dubai International Airport (DXB). DXB, the world’s largest airport by international traffic, recorded 83.7 million passengers in 2016, up 26 per cent from 2014. In 2017 this has increased further to over 88 million passengers. A prime facilitator of this is the home-grown Emirates Airline – which demonstrates how improving transport options can help bring a city into the global spotlight. From humble beginnings in 1985 with just two leased planes, Emirates now serves over 150 destinations on six continents with a modern fleet of 259 wide-body aircraft, with orders of 76 additional aircraft placed in 2017 alone. Assuming this historic growth rate continues, we expect that the DXB will reach its target of 100 million passengers by 2020. Whilst Dubai’s appeal is broad, the Emirate has established itself as one of the most luxurious destinations in the world. 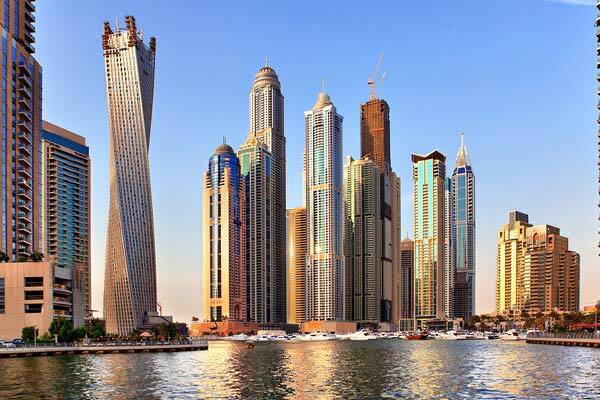 Currently, it is home to 104 five star-hotels as per Dubai Corporation of Tourism & Commerce Marketing and forecasts indicate that there are 53 hotels five-star hotels in planning or construction with opening dates before 2020. In addition to this, Dubai’s average spend per overnight visitor is estimated to be over $2,000 in 2017, the highest amongst our global hub cities. Delving deeper into Dubai’s hotel sector, the total number of hotel keys per resident is highest amongst our global hub cities at 29.9 per 1,000 in Dubai. Although this is not a surprise given the disparity in populations between Dubai and these cities, what is surprising is the speed at which the number of keys has grown, up 150 per cent in the 10 years to 2017.